The forecast is wrong - how do I fix it? What is the sales velocity? Does it look accurate? Is the product marked as seasonal? Are your days of stock set correctly? 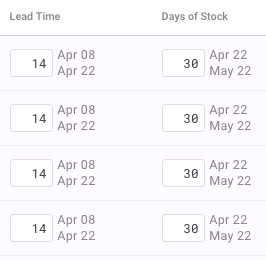 Note that you will need to set the days of stock for your store. Is your lead time correct? Note that you will need to set the lead time for your store. Lead time only applies to replenishment recommendations and does not apply to the forecasted sales. What is your replenishment date? This indicates the last date to order to avoid stockouts. There will be replenishment recommendations before this date. Are there out of stock days (stockouts) affecting the forecast? What is the time period for sales history? Sales velocity is the rate of sales excluding stockouts (days when the item is out of stock). This will inform you about the rate of predicted sales. 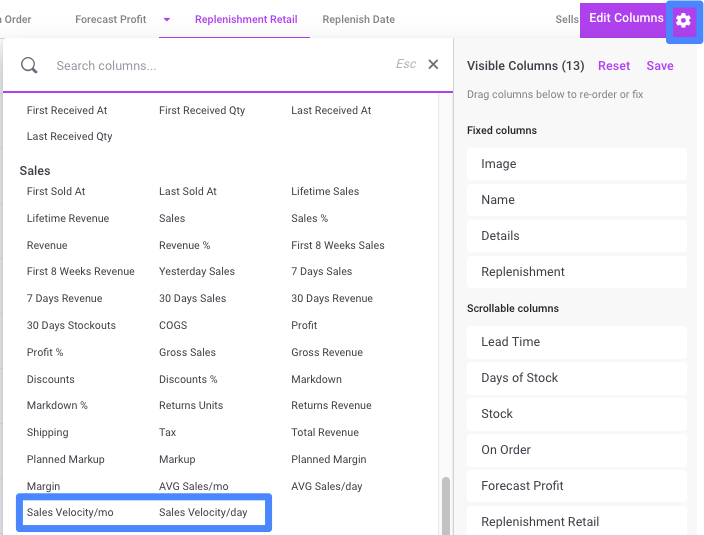 To check the sales velocity, add columns to your Replenishment report by clicking the gear icon in the upper right corner. When most of your products have more than 12 months sales history, you can use the seasonality to estimate the a forecasted increase in sales. Given a seasonal product, the forecasting algorithm puts more weight on sales 12 months ago and therefore accounts for the increase in sales (if any) of each particular product. 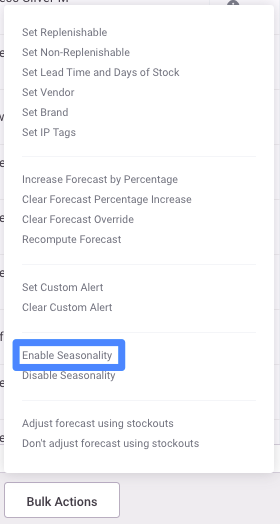 To enable seasonal forecasting, select products in the Replenishment report and click Bulk Actions > Enable seasonality. Days of stock is a period of time for which you’d like to have enough stock, or, in other words, the desired stock cover. The dates your stock will cover is noted next to the Days of Stock field. Dates shown in Days of Stock begin after the Lead Time. The lead time is the amount of time between between placing a purchase order with your supplier and receiving products in your store or warehouse. Your supplier may tell you the lead time or you can determine it by reviewing past orders in Reports > Good Received Note. When in doubt, add a few days. For more information on how to determine lead time and days of stock, read our article here. The replenishment date indicates the last date to order to avoid stockouts. 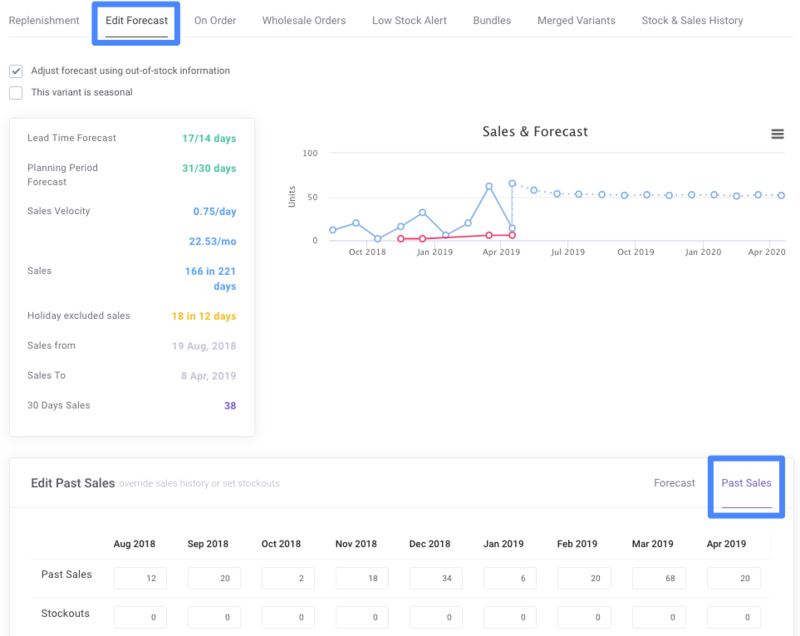 This date is based on your current stock level, sales forecast (sales velocity), and lead time. There will be replenishment recommendations before this date. View the sales history for the SKU in question. Are there out of stock days (stockouts) that are affecting the forecast? 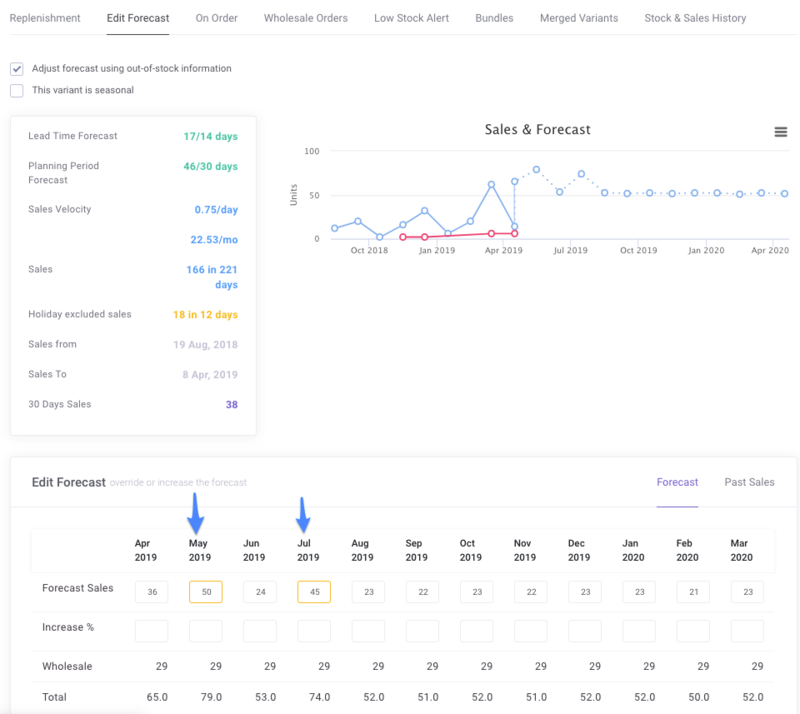 A crucial component of the forecast is the sales velocity, which excludes stockout days to determine the rate of sales if your store was fully in stock. View the sales history in Replenishment > Details. 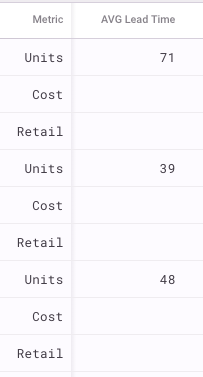 Then click on the Edit Forecast tab then Past Sales to see stockouts. Any manual changes to forecasted sales will appear with a yellow outline. 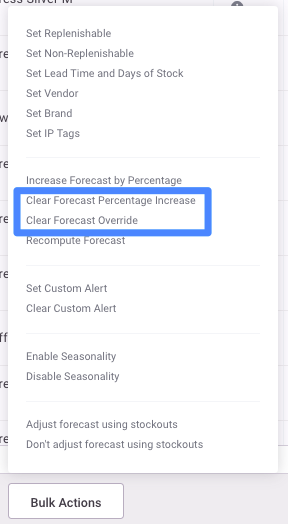 To remove manual overrides to the forecast, you can delete any of these entries and Inventory Planner will automatically replace it with the default forecast. Alternatively, you can clear any manual overrides in the Replenishment report using Bulk Actions. Finally, review the date range Inventory Planner uses to consider trends in the sales history, including calculating the sales velocity. Any orders from customers during this time period will be used to calculate metrics and the forecast. If sales were significantly higher or lower two years ago than they have been in recent months, it may make sense to limit this time period to the last six months or year.